Caremark (Wandsworth) were kept very busy this week at the Work Match Jobs Fair held in the York Road Library, Battersea. The fair was a great success with over 860 local residents attending the event. This is the second event they have attended with Work Match Jobs, the first being in January of this year and both events have created strong interest from people looking for work, particularly work in the social care sector. The Battersea home care provider was keen to be part of Wandsworth Borough Council's inititative to get people into work and was therefore delighted to accept the invitation to exhibit at the Jobs Fair. With a rapidly growing business, Caremark (Wandsworth) was keen to tap into the talent pool of local job seekers, hoping to find good candidates who would be interested in a career in care and in making a difference to people in their local community. 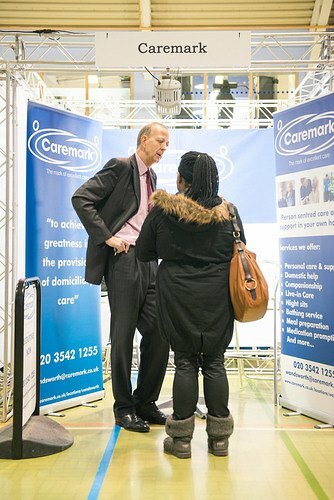 Reflecting on this week's Job Fair, James McCalllum, Managing Director of Caremark (Wandsworth) said: "The second Jobs Fair on Monday 17 March was really busy for us - non-stop interest from 11am to 4pm, with around 60 people stopping to discuss a career in the care sector. The event was a phenomenal success for our recruitment campaign and we were really pleased to be speaking to so many people about a career with us in social care."